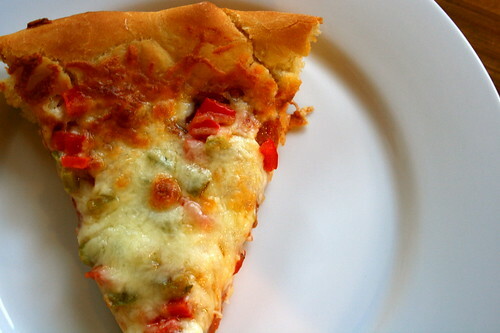 There’s something comforting about a slice of deep dish pizza. Nearly every weekend, we order takeout from one of our local pizzerias. Paired with a good movie and a glass of wine, it makes for a perfect Saturday evening. Our town has a few places known for their pizza. Leonardo’s makes a Chicago-style pie, and when we lived on that side of town, we were regulars. Satchel’s is probably the most locally-famous with loyal followers who proudly display Satchel’s bumper stickers on their cars. I’m sad to say that, although we’ve lived here since 2001, we’ve only been to Satchel’s once. We took our then-2 year old daughter, and we made the mistake of arriving about 15 minutes before her regular dinner time. The wait for food was probably 45 minutes. By the time the pizza came, we were so frazzled from dealing with an impatient – and loud – 2 year old that I can’t even remember anything about the meal itself. We haven’t been back. Our new favorite, partly due to location, but mostly due to their quality pizza, is Blue Highway Pizza. Our standby? The Sicilian pepperoni, a rectangular thick-crust pan pizza that always yields enough for leftovers. 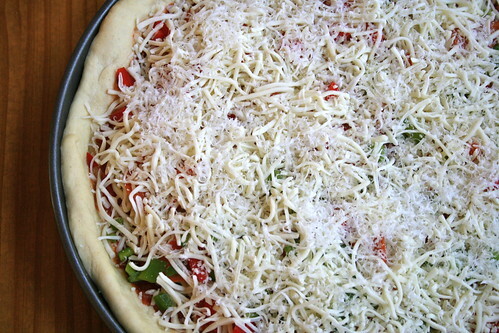 Since the weekends are when I can spend time cooking, I decided to use Saturday to make a deep dish pizza from scratch. 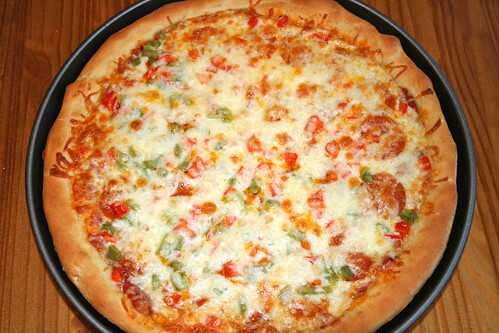 I’ve never made pizza crust dough, and while it would be really easy to pick up some dough at Publix, the idea of making the dough myself was appealing. I cheated a bit, though. I bought King Arthur Flour’s pizza crust kit. I still got to add yeast, and I was able to use my KitchenAid stand mixer with the dough hook for kneading the dough. I had forgotten how wonderful that yeasty dough smell is. 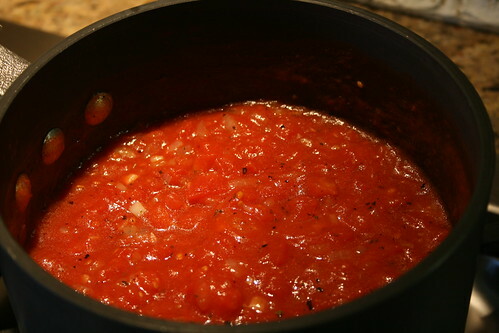 For the sauce, I modeled it after Mike’s Pizza Sauce from Last Night’s Dinner. I used a can of crushed San Marzano tomatoes, a couple of cloves of garlic, some olive oil, an onion, and a bit of dried oregano, basil, and kosher salt. I would have loved some larger tomato pieces, but my husband is anti-tomato, so I’ve learned to compromise. Petite diced canned tomatoes are okay, but regular diced tomatoes are not. You get the picture. The sauce was good, but next time I’ll add some red pepper flakes to give some heat. Toppings are always a compromise when you live with picky eaters (i.e, everyone in this house but me). 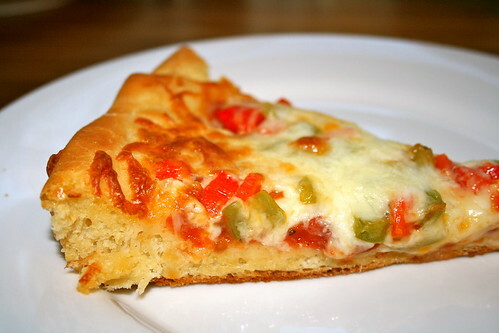 I went with good-ol’ pepperoni, but on half of the pie I added diced green bell pepper. And, thinking the kids would not be able to tell them apart from the red tomato sauce, I added some chopped red bell pepper. But they could tell. They’re smarter than I gave them credit for, as usual. The verdict? The husband and I really liked it. My 6 year old daughter liked it, and she even ate some of the red bell pepper (it’s sweet, you know). My 3 year old son refused to eat a single bite. It was fun making our usual Saturday night meal instead of ordering it from the pizzeria. I’m not sure I saved us much money, but it’s always a great feeling to know where your food comes from and how it was prepared. It’s February, and although I live in Florida, it’s cold. And I am so over it. We Floridians crave the first cold night of the season, the first opportunity to wear a sweater and jeans, the rare occasion to turn on the gas fireplace, being able to turn off the air conditioner for once. But this cold snap has gone on too long. By Valentine’s Day weekend, I was ready for to put my sandals on again. 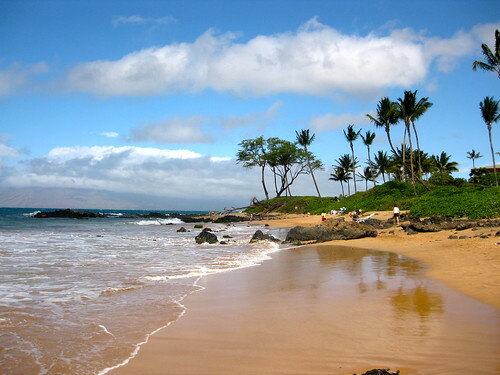 My husband and I took a brief reprieve from the cold this year – a week-long trip to Maui. And I must confess that, while the purpose of the trip was for a work conference, we mostly played. And it was fabulous. We had some really nice dining experiences, and we spent way too much money on food. I’m not sure it’s even possible to NOT spend too much money on food in Maui. 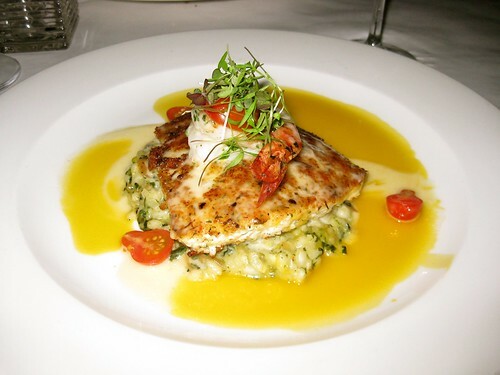 It was not uncommon to see a fish entree on a restaurant menu for $40 to $50. 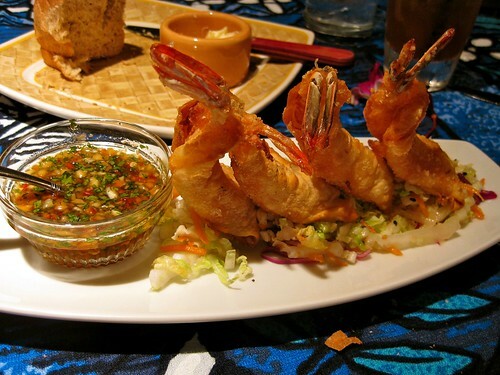 We went to one really standout restaurant, the Lahaina Grill, that blew our minds and won our hearts. The restaurant was elegant and classy, the service was thoughtful and attentive, and each course was carefully prepared, presented artfully, and tasted, well, delicious. In fact, when each dish was sat down before us, the only thing we could talk about was how wonderful it all tasted. It got me thinking about the other two meals we ate on Maui that were around the same price point (i.e., expensive). One of the dinners was at Mama’s Fish House, a classic Hawaiian restaurant that’s one of Maui’s most famous. The other dinner was at a restaurant so memorable that I’ve forgotten it’s name. Our bill at Mama’s Fish House was almost identical to our bill at Lahaina Grill, but we were not as blown away by the quality. Mama’s has atmosphere. Situated on an ocean cove, the 37-year old restaurant opens out onto a white sand beach. With tropical breezes flowing through the restaurant, we couldn’t help but relax and enjoy ourselves. The meal was very good, but we left the restaurant feeling like we spent a lot of money simply to eat on a beach. 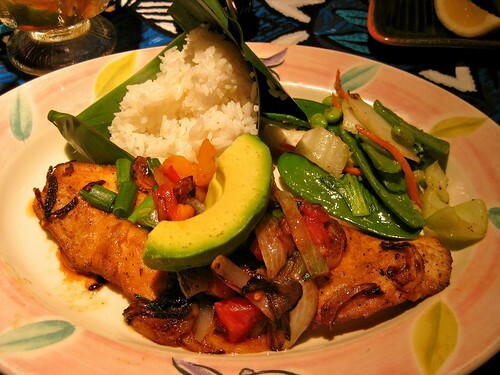 The quality of the food didn’t quite match the level of quality we experienced at Lahaina Grill. And back to the third restaurant, the forgettable one. We felt like we may as well be eating at Red Lobster. Or, maybe Red Lobster is better than that – I’m not sure since I’ve not been to the RL for many years. This restaurant was in the touristy part of Maui, so it’s very possible, and most likely, that we were just getting the usual tourist rip-off. We regretted the $100 meal, especially after we realized we could have eaten at Lahaina Grill one last time for just a tad more. My husband and I have had lots of great dining experiences over the last several years, and it’s been an educational experience. I’ve learned that quality of ingredients – including freshness and seasonality – are vitally important. But even the freshest, seasonal fish can be ruined by an uninspired and overworked chef. Creativity, passion, respect for food – these are the ingredients that draw us in and keep us coming back. 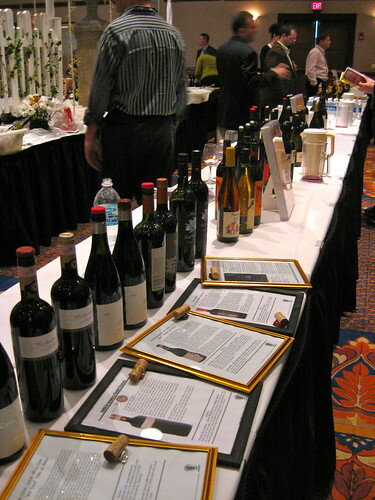 This weekend was the annual Celebration of Wine charity wine tasting and wine auction. The proceeds from ticket and auction sales benefit local public radio. There were over 300 wines to taste, but we went with a cheat sheet of wines we knew we simply must try. With wine glass and map in hand, we wandered around the 39 tables and tried champagnes, proseccos, chardonnays, sauvignon blancs, zinfandels, meritages, cabernet sauvignons, and even a dessert wine or two. Some of my favorites included the Ridge Zinfandel Ponzo, the Lail Blueprint Cabernet Sauvignon, a Corison Napa Cabernet Sauvignon, and the Barlow Barrouge Cabernet/Merlot blend. 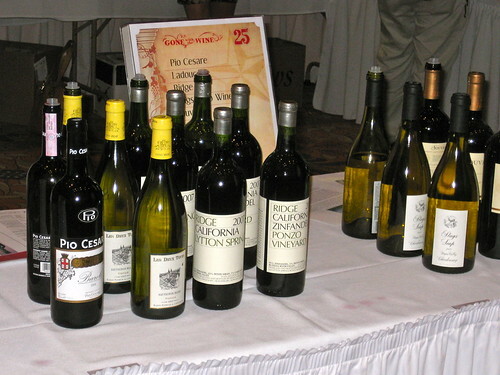 We had tasted several of the wines before, some on our 2009 trip to Napa. Because we knew of some that we liked already, we went back to have another taste of some favorites – the Ehlers 1886 Cabernet Sauvignon, Belle Glos Las Alturas Pinot Noir, and the Alexander Valley Vineyard’s showcase wine, Cyrus. They did not disappoint. Breaks were critical. If we’d tasted wines for five hours straight, we’d have been stumbling home. 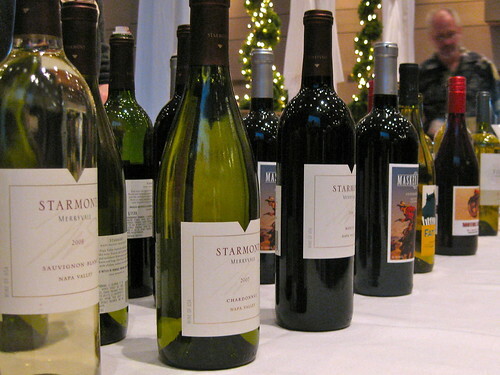 The silent wine auction gave us a good excuse to leave the tasting room. Plus, I’m a sucker for silent auctions, so I had to get a good look at the bidding sheets to see what kind of competition I’d be up against. 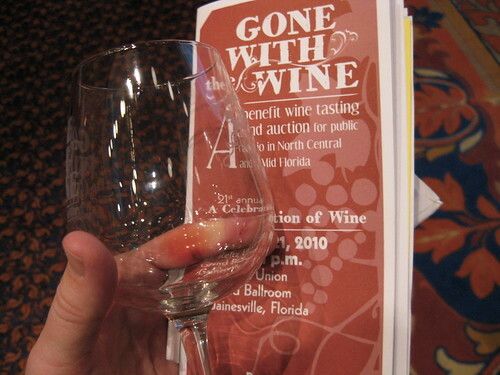 The Celebration of Wine always ends with a live wine auction. 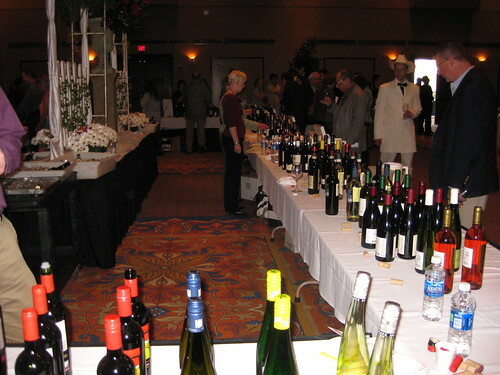 Last year, probably due to the horrible economy, the wine auction was filled with great bargains. We were expecting that this year, but people were very generous with their donations during this auction. In fact, the couple of items we tried to bid on were quickly bid up past retail value and out of our price range. Not good for us, but very good for public radio. And, in hindsight, it was probably good for us too. We can definitely find other uses for that money. We did walk out with one “win” in the silent auction. Last June in Napa, we spent an amazing afternoon at the Oakville Ranch winery in Napa. 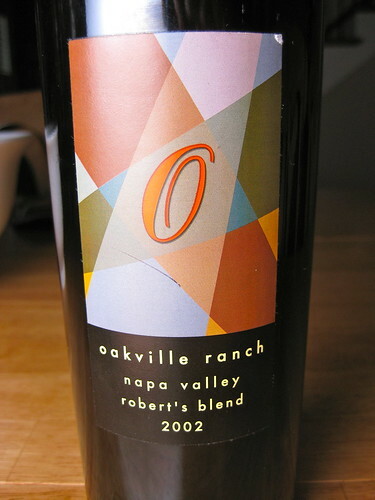 When we saw the 2002 Oakville Ranch Robert’s Blend in the auction list, I knew that we’d be bidding on it. It will probably sit collecting dust for a while, but when we do drink it, we’ll have great memories of our trip there last summer.